In the live setting last night, [the new songs] not only fit perfectly with all of her other material, they often highlighted the set. Sandwiched in between two of her most massive songs to date (“Emily” and “Have One On Me”), “Waltz of the 101st Lightborne” had the same show-stopping effect as those songs, with Ryan and Mirabi’s guitar and violin flourishes popping out as much as Joanna’s own presence. Divers‘ lengthy title track was another show stopper, but in the opposite way. It was one of the nights quieter songs, and had the crowd in a silent trance the whole time. The crowd was like that the whole show, really. If someone near you so much as coughed or shifted in their seat, you could hear them during Joanna’s quiet parts. 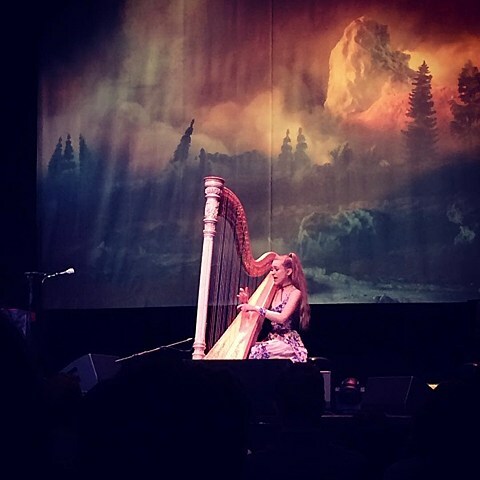 The above quote is from our review of Joanna Newsom‘s Brooklyn show last night (12/7), the second stop on her ongoing tour in support of this year’s excellent Divers. The tour has dates scheduled through April, and hits Chicago this month on December 16 at Chicago Theatre. Her current tourmates Alela Diane & Ryan Francesconi (the latter of which is also playing in Joanna’s band) open. Tickets for the Chicago show are on sale now.